Preheat oven 350 degrees F. In a medium bowl, mix together Ricotta cheese, spinach, Mozzarella cheese, 2 Tbsp. of Parmesan cheese and eggs. Cover and set aside. In a large skillet over medium high heat, brown sausage for 4 to 6 minutes, or until cooked through, stirring until small crumbles form. Drain fat if needed. 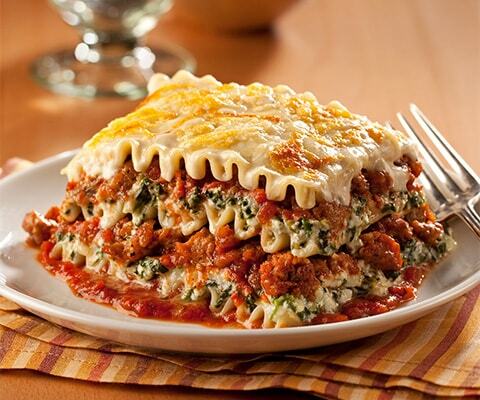 Spread 1 cup of Classico® Traditional Sweet Basil Pasta Sauce evenly over the bottom of 13x9 baking dish. Layer with 4 lasagna noodles, half of ricotta cheese mixture, 1 cup of Classico® Traditional Sweet Basil Pasta Sauce and half of cooked sausage. Repeat layers. Top with remaining 4 lasagna noodles. Spread Classico® Sun-dried Tomato Alfredo Pasta Sauce evenly on top of noodles and sprinkle witht remaining 2 Tbsp. of Parmesan cheese. Cover tightly with aluminum foil and bake for 40 minutes. Remove foil and bake for additional 15 minutes, or until hot and bubbly and an internal temperature of 165°F is reached. Allow to rest for 5 to 10 minutes before serving. If desired, substitute Classico® Traditional Sweet Basil Pasta Sauce with Classico® Tomato and Basil Pasta Sauce or Classico® Four Cheese Pasta Sauce. If desired, substitute Classico® Creamy Alfredo Pasta Sauce with Classico® Sun-dried Tomato Alfredo Pasta Sauce. Wonder if I can prep this and freeze before baking? I really like using the 2 sauces. It is creamy and tasty.